By any measure, Gladys Knight is one of the greatest Soul singers of all time. Her expressive, powerful voice became the model for two generations of singers from Jennifer Holliday to Alicia Keys, and her work with the Pips stands tall among the best Soul music of the 60s, 70s and 80s. Born and raised in Georgia, Knight showed her impressive vocal talent early, winning on Ted Mack's Amateur Hour as a child. As a pre-teen in the 50s, she formed a singing group with brother Bubba and cousins William Guest and Edward Patten, a group that would later be called Gladys Knight and the Pips. The group performed together around Georgia for several years and began recording in the early 60s. They scored a couple R&B hits on small labels, including "Every Beat of My Heart" and "Letter Full of Tears." But it was their 1965 signing by Motown that gave them their first major national exposure. Considered the beautiful Southern darling by other artists at Motown, Knight was not always given the attention of Motown brass, and her career at the label was clearly one of a "secondary" artist, though she did record a number of memorable songs. Working with producer Norman Whitfield, Knight was generally given rawer, gutsier material than most of her Motown labelmates, and she scored big R&B hits with the original, funky version of "I Heard It Through the Grapevine" (later remade into a smash by Marvin Gaye), as well as the dance cuts "Friendship Train" and "Nitty Gritty." However, when given the chance, Knight also proved herself a great balladeer, such as on "If I Were Your Woman" and her last Motown hit, "Neither One of Us." 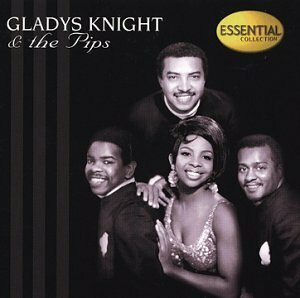 In 1973, Gladys Knight and the Pips moved to Buddah Records, where, working with writer Jim Weatherly, they took on a more sophisticated sound that blended the Pips smooth harmonies with Knight's gritty lead vocals. The results were memorable, and the group became perhaps the top Soul group of the mid-70s, boasting a string of number one hits including "I've Got To Use My Imagination," "I Feel A Song," "Best Thing That Every Happened" and their biggest song, "Midnight Train To Georgia." Knight also ventured into acting around this time, landing a lead role in the movie Pipe Dreams. The hits slowed down for the group as the 70s came to a close, and they moved to Columbia, where, recording with hotter young producers such as Leon Sylvers, they rose again to the top of the Soul charts with "Landlord," "You're Number One (In My Book")" and the smash dance hit "Save The Overtime." They later signed with MCA, where they scored in 1987 with their last major crossover hit, "Love Overboard." In 1989, after over three decades together, Gladys and the Pips decided to go their separate ways. The Pips recorded one album without Gladys before retiring. Knight, on the other hand, moved smoothly into a solo career, scoring an immediate hit with "Men." She continued to record on MCA through the 90s with moderate success and appeared in the national touring company of Smokey Joe's Cafe. In 1999, she recorded her first Gospel album, the critically acclaimed Many Different Roads, and in 2001 released At Last, an album of standards that earned a Grammy for Best Traditional R&B album. In 2004, Knight released a single, "Feelin Good" on Miami-based Pyramid Records in Summer of 2004. It was part of the Cuban/US music compilation, Bridge to Havana. She followed it in 2005 with One Voice, a Gospel album recorded with the Saints Unified choir. In early 2006 she recorded Before Me, an album of standards, on Verve Records. The disc was originally slated for a Spring 2006 release, but was delayed until October to correspond to a PBS Special starring Knight. While Knight has not been as much in the public eye in recent years, her influence over so many artists continues to be strong, forty years after America first saw her immense talent.